Just when you thought the Chicago Bears had a welcomed distraction with the start of the National Title game, a couple of NBA games, and some NHL games on TV — they go and get reminded of their failures some 24 hours later. On Sunday, Bears called upon their kicker Cody Parkey to knock down a 43-yard field goal and send the team into the Divisional Round of the playoffs. What they got was a tipped ball at the line that first hit the upright and then the cross bar before hitting the ground and a dejected fan base. On Monday, the Philadelphia Flyers were taking on the St. Louis Blues and Cody Parkey’s name would come up again on this night. 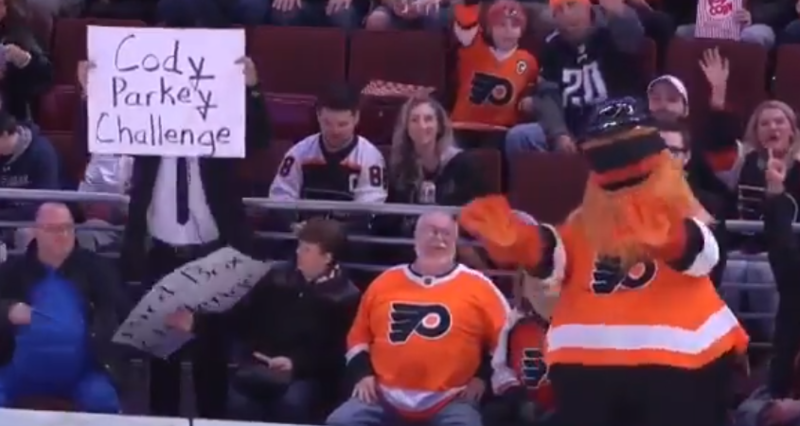 This time around, Flyers’ mascot ‘Gritty’ was entertaining the fans by doing the ‘Bird Box Challenge’ which ultimately ended up being the ‘Cody Parkey Challenge’ as he kicked a field goal into the stands below.